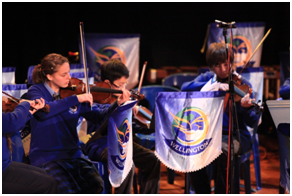 The Instrumental Music Program at Wellington Secondary College is an ensemble-based program, combining orchestral and contemporary styles. 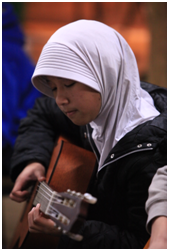 Students are required to attend weekly lessons on a rotating timetable set each term by their Instrumental Music teacher. This means that students are withdrawn from their classroom lesson for one period each week on a rotating schedule so they do not miss the same subject each week. Students are placed in an ensemble (group) such as String Ensemble, and they are required to attend weekly rehearsals, either at lunchtime or after school for approximately 30 minutes. Playing in an ensemble builds social and team skills, it is fun and each ensemble works throughout the year to perform at two concerts, usually held in the evening in the MJP Theatre. These concerts allow the students to demonstrate the development of their performance and musical skills to families and friends. 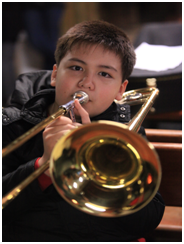 At the beginning of each new school year the College holds an Instrument Recruitment Night for students and parents interested in learning an instrument. On the Instrument Recruitment Night students can try out a range of different instruments to see which one might be suitable, and this event is attended by our Instrumental Music staff, along with representatives from Cranbourne Music and Wrights Music. Families are encouraged to purchase their own instruments with guidance from our preferred instrument suppliers – Cranbourne Music and Allegro Music Supplies. A competitive and reasonable tuition fee is payable at the start of each year for lessons. The College also has a limited number of instruments available to hire, and an application form available from the Performing Arts Office must be submitted with a hire payment fee. Details are available on application.